I have a zoo series with many missing values. I read that auto.arima can impute these missing values? Can anyone can teach me how to do it? thanks a lot! First, be aware that forecast computes out-of-sample predictions but you are interested in in-sample observations. The Kalman filter handles missing values. Thus you can take the state space form of the ARIMA model from the output returned by forecast::auto.arima or stats::arima and pass it to KalmanRun. In a previous version I took the column of the filtered states related to the observed series, however I should use the entire matrix and do the corresponding matrix operation of the observation equation, $y_t = Z \alpha_t$. (Thanks to @stats0007 for the comments.) Below I update the code and plot accordingly. Dealing with missing observations by means of the Kalman filter is sometimes interpreted as extrapolation of the series; when the Kalman smoother is used, missing observations are said to be filled in by interpolation in the observed series. Thx for your post, very interesting! Why do you use KalmanRun instead of KalmanSmooth ? I read KalmanRun is considered extrapolation, while smooth would be estimation. I also do not get your id part. Why don't you use all components in .Z ? I mean for example .Z gives 1, 0,0,0,0,1,-1 -> 7 values. This would mean .smooth (in your case for KalmanRun states) gives me 7 columns. As I understand alle columns which are 1 or -1 go into the model. Is my solution wrong? Or are they both ok? Can you perhaps explain to me further? Not the answer you're looking for? Browse other questions tagged arima or ask your own question. How do I handle nonexistent or missing data? 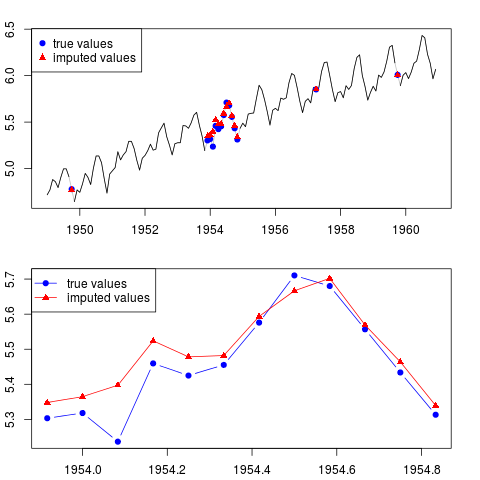 How to compare ARIMA model in R to actual observations used to create the model?